Experience an easier way to ship your goods with more flexibility, reliability and global access from North America. The LCL shipping method is an economical way to ship cargo if the shipment is smaller in size and not large enough to use full container load service. Pallets or wood crates (lift vans) are used to stack and ship LCL goods, such as boxes and furniture. LCL shipments are professionally stacked to the full capacity of the pallets or crates and then shrink wrapped. Each pallet or crate is marked as part of the shipment and documented on the ocean bills of lading. What size is considered Consolidated shipment? Shipments totaling 0 to 500 cubic feet OR LESS. Once the shipment size is over 500 cubic feet, it is more cost-effective to choose a 20’ container load and then have space to ship more items for the same price (for household goods, partial home, studio apartment or small one bedroom apartment). How do you charge for Consolidated shipments? Consolidated shipping costs are calculated based on a price per cubic feet. All LCL shipments are measured at the export terminal to determine the final cubic footage of the shipment and are then loaded into the steel container for the freight transport. What type of Shipping Supplies do I need when shipping consolidated shipment? How do you calculate final shipping volume? To calculate the final size of the shipment, each pallet or crate is measured by multiplying the longest, widest and highest point sof the pallet or crate. For example a 48″ X (1.2m) X 40″ (1m) X 6′ x (1.82m)pallet would equal 2.28cm gross cubic meters (or 80 gross cubic feet). Please be aware that palletizing or crating cargo can cause dead space in the pallet or crate — depending on the items shipped, palletizing may increase volume by 10% – 15%). The final size of the shipment will be documented on the ocean bills of lading. 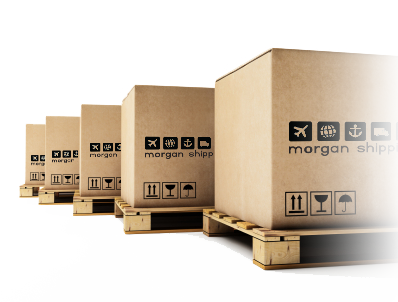 Morgan Shipping requires that all consolidated shipments be palletized or crated no matter if a shipper is requesting the palletizing or not. There is NO COST for palletizing LCL shipments. However, wooden crates are at cost depending on the size of the crate. Visit crate options page.